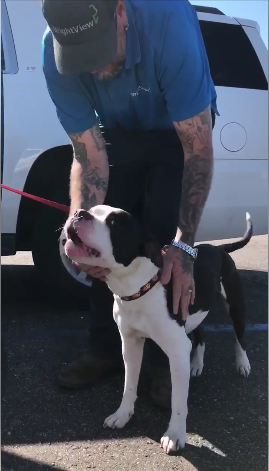 The Arizona Department of Public Safety is praising some District 12 troopers who helped locate and rescue a pit bull mix dog that was ejected from his owner's vehicle and lost on March 12. "Troopers spent hours that day looking for the dog (named "Dozer") without success. Between March 12 and March 25, troopers received several calls for a dog matching Dozer’s description, and each time, troopers could not locate the dog. "Troopers spent time, including their lunch breaks, looking for Dozer in hopes they would find him. Based on the multiple calls, they believed Dozer to be alive. Troopers then reached out to Central Arizona Animal Search and Rescue for additional help. "A trap was set in the area of the crash with troopers and volunteers consistently checking the trap for Dozer. On March 25, Dozer was found in the trap by a rescue volunteer. "Dozer was thin and exhausted but did not have any major injuries and was in good spirits. Dozer was returned to his owner by one of the volunteers along with Trooper Randi Wybron. Trooper Wybron spent a lot of time and energy searching for Dozer and it paid off in the end."